Asus Laptop Is Running Slow, How to Fix? Is your new ASUS laptop running slowly? General speaking, this issue is caused by system problems rather than hardware issues. When there are overloaded startup services, junks files, caches and temporary files so on, they will largely infect the performance of your Asus laptop. For how to fix Asus laptop running slow, all you need is a professional PC care tool. Tenorshare Windows Care Genius, as the world-class PC clean and Speed Up tool, is well designed to keep your new ROG/Zenbook/K/N/X/E/F Asus laptop with Windows 10/8/7 clean and make it run fast. Just with one click, you’re capable of cleaning registry and junk files to get best performance on your PC. What Can Windows Care Genius Do for You? If your Asus laptop is running too slow or the browser takes longer than usual to load websites, this perfect PC optimize will optimize PC stability and overall performance, giving you faster PC enjoyments, downloads, uploads, web surfing and more. Fix all issues making your Asus laptop slow down and unstable. Speed up hard drive and application performance by accessing the disk defragmentation tool. Automatically manage registry to significantly improve system performance. Disable unneeded programs that consume your precious system resources and improve PC startup and shutdown speed. Efficiently prevent computer from freezing and crash. When it comes to how to fix a slow Asus laptop in a feasible way, here are two effective solutions offered for you! 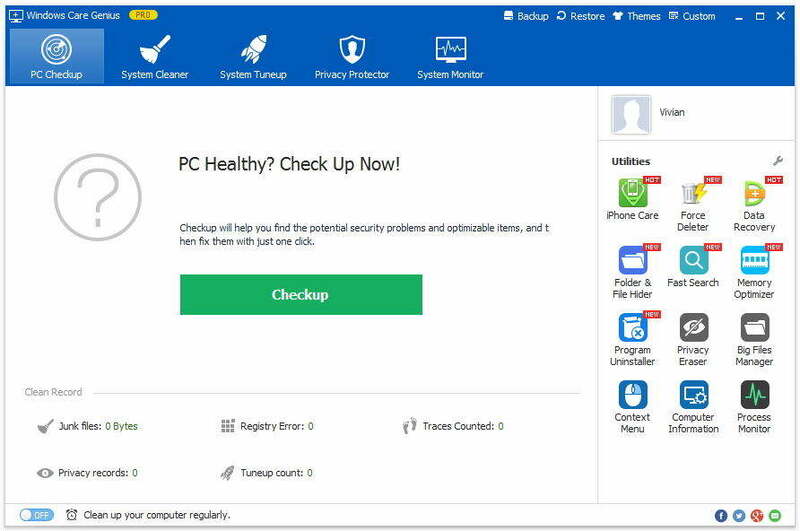 Launch the program and click Checkup to analysis the whole heath status of your PC. Then your computer will be scanned automatically. Click Fix to fix all the problems or fix them one by one. System Tuneup is featured with five functions including System Optimizer, Disk Defrag, Registry Defrag, Startup Manager and Context Menu. For a deeper optimizing of your Asus laptop, you can navigate to System Optimizer to improve your laptop well! Launch the program and select System Tuneup and then click System Optimizer. Choose the items you want to optimize or click Select All on the bottom. Then click Optimize to finish. If you want to make full use of this powerful third-party software tool, please read the guide of it carefully to solve more problems! Moreover, try to keep a good habit of scanning your Asus laptop regularly to make it run fast!